Emily McKay, a member of Glassmen's color guard since 2004, sent this picture. 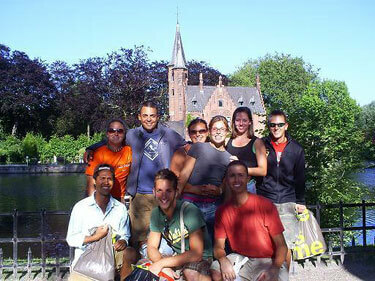 This is a picture of a few Glassmen members on a free day in Bruges, Belgium. It's in front of a church located along a river heading into the city. After a long day of shopping, we realized we hadn't taken many pictures of the scenery. This seemed like a good photo-op, so naturally we took advantage of it. Top left to right: Emily McKay, Bo Sodders, Krystle Breden, Nicole Holderman, Brooke Bailey, Kevin Lawlis.